Mail Chimp Addon for ACT! MailChimp is the market leader for email marketing. With an intuitive and modern interface, hundreds of pre-designed templates, extensive features, tons of integrations and a generous free plan (up to 2,000 subscribers and 12,000 emails per month) MailChimp is the email service to use. Using the MailChimp plugin by Exponenciel Act! 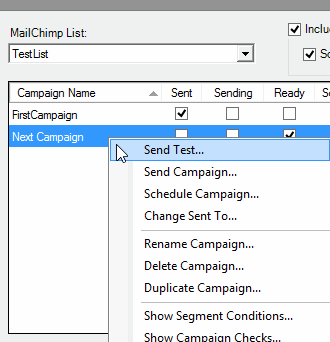 users can easily keep their MailChimp list up-to-date and access important campaign results from within Act! MailChimp pricing is based on a monthly, per account basis. *MailChimp's free plan has some limitations, read about them here. And much, much more - you can read the full feature list here. Import new MailChimp subscribers to Act! Import campaign results to Act!